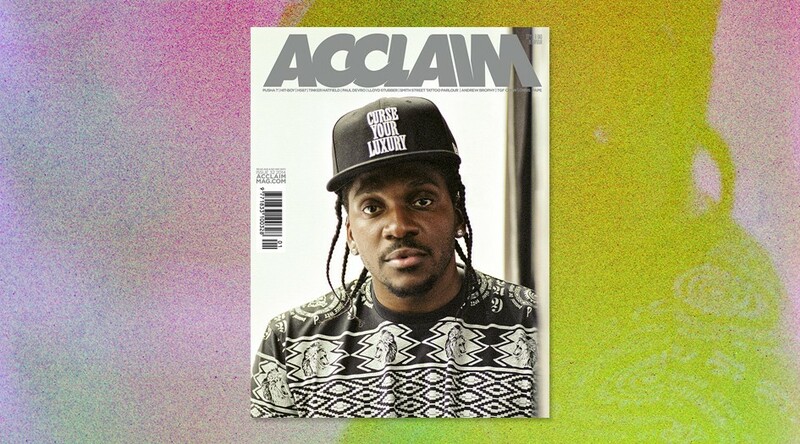 For an artist who began touring in his teens with Kelis, went gold on the US charts not long after and is signed with Kanye West, Pusha T has approached his solo ventures with the vigour of a fresh-faced rapper straight off the mixtape scene. This hunger for “competing with the best of the best” has driven him to release two future-classic mixtapes (Fear of God, Wrath of Cain) and his acclaimed solo debut proper, My Name is My Name. Even after the end-of-2013 ‘best album’ plaudits piled up he continues to strive for more. Poised for greatness from almost the beginning, Pusha and real-life brother Gene ‘Malice’ Thornton were discovered in their teens by now-industry titan Pharrell Williams. The Neptunes producer, who himself was still looking to make his major mark, helped them sign their first deal with Elektra Records in 1997. While the label association would eventually go sour, including the recording of a shelved album in Exclusive Audio Footage, in 2002 they would go on to hit the hip-hop scene like an atomic bomb with Lord Willin’. Combining their sophisticated rhyme patterns and natural charisma with Neptunes beats, the Clipse topped both the R&B/Hip-Hop and Hot 200 charts in the US. Seeing more than its fair share of trappers-turned-rappers since their emergence, the duo is now revered as a pioneering force on the hip-hop landscape. While at the time they would go underappreciated by industry types, every subsequent Clipse release would be met with feverish anticipation by those in the know. They would release two other acclaimed albums and several side-projects, including the heralded We Got it 4 Cheap mixtape series, before going their separate ways in 2011. The renamed No Malice went on a new path as a devout Christian and released the solo effort Hear Ye Him, while Pusha looked to build on his legacy, signing a solo deal through Kanye West’s GOOD Music imprint. This feature is taken from our upcoming issue, ACCLAIM 32 – The ‘Team Player’ Issue. On shelves Monday, April 14th.